Is it a bounce house or a dance party? YES! 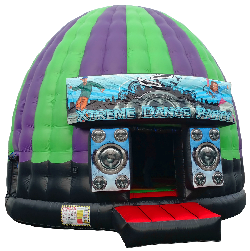 Booming sound system, party lights and windows that can be covered to block the light make the Dance Dome a top party rental. Jump, sing and dance with your friends in this all-ages bounce house. Play your own music via Bluetooth and other inputs (RCA, USB, Microphone hookup). Large 17 foot diameter floor for more room or more players. Interior is over 17 feet high. Use the door and window covers to make the interior dark. Note: Not available for rain use. CAUTION: lighting may affect seizure disorders.